Notice: Per the Area Quarantine issued February 27, 2019, all commercial/independent/small poultry businesses shall enhance their biosecurity as required by CDFA. CDFA enhanced biosecurity requirements are contained in the California Secure Food Supply Guidance document and Secure Food Supply Plan template. CDFA and USDA are currently enforcing these requirements. One of the conditions for movement of poultry, eggs, supplies and other items that can spread vND, is approved and verified minimum biosecurity as outlined in the Secure Food Supply Guidance and Plan Template. If a farm is not meeting these biosecurity standards, movement permits will be revoked. Finally, violations of disease prevention minimum requirements can put indemnity in jeopardy if a farm becomes infected. Poultry related businesses not meeting these biosecurity standards will be subject to violations and fines. For more information, please visit the California Secure Food Supply Page. Unfortunately, even individual birds and flocks that previously tested negative, but later become exposed to the disease, must be euthanized. USDA/CDFA staff will contact affected bird owners with orders specific to their property. For more information please refer to: Virulent Newcastle Disease FAQs or call the Sick Bird Hotline at 866-922-2473. * Poultry species are defined as: chickens, turkeys, turkins, pheasants, peafowl, guinea fowl, quail, ducks, geese, swans, gallinules, doves, pigeons, grouse, partridges, francolin, tinamou, ostriches, and other ratites (including but not limited to the rhea, emu, and cassowary), and hatching or embryonated eggs. The virus is found in respiratory discharges and feces and may cause high rates of sickness and death in susceptible birds. For poultry, chickens are most susceptible and ducks and geese are the least susceptible. Mortality rates for Psittacine birds (parrots) can range from zero up to 75%. Certain parrots, especially Amazon parrots, can shed VND virus intermittently in excess of one year. Other birds may be infected, but may not show any symptoms and may still be able to spread the disease. Once VND is introduced into domestic avian populations, subsequent spread is normally caused by domestic bird-to-bird contact or through contact with contaminated people, feed or equipment. Other types of Newcastle disease known as lentogenic and mesogenic are less virulent and may cause mild symptoms or none at all. There is no effective cure for virulent Newcastle Disease. It is important that all commercial and non-commercial poultry owners maintain effective barriers to mitigate the risk of VND. March 15, 2019: One chicken, submitted to a veterinary office in Redwood City, by a backyard bird owner that lived in Alameda County, has been confirmed positive for VND and has been euthanized. At this moment, CDFA and USDA are not aware of any other cases in Northern California, but are very actively investigating. 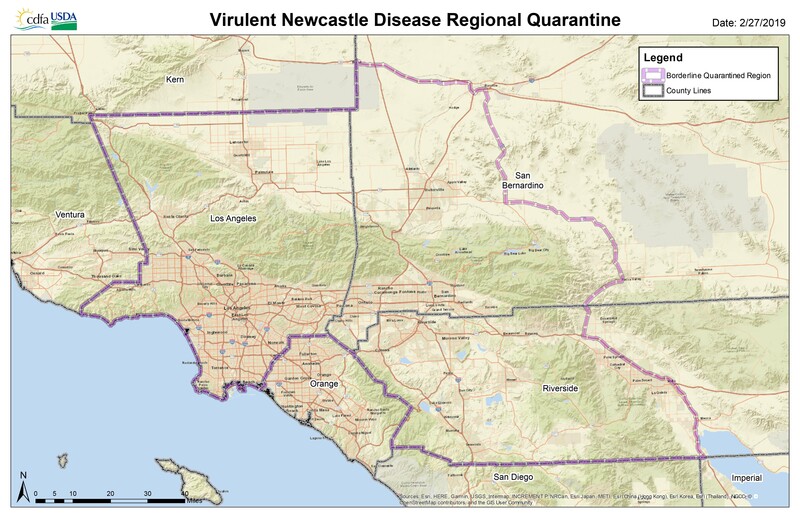 SACRAMENTO, February 27, 2019 — California State Veterinarian Dr. Annette Jones today modified Southern California's quarantine area to further restrict bird movement as work continues to eradicate virulent Newcastle disease (VND). The quarantine mandates the reporting of sick birds and prohibits poultry owners from moving birds in all of Los Angeles County, and in large areas of San Bernardino and Riverside counties. The modified quarantine extends from the northern and southern borders of western Riverside County to the Salton Sea-including the Coachella Valley-and as far east as Yucca Valley in San Bernardino County, with a northern boundary of State Route 58 at the Kern County line. The quarantine language and a map may be found at CDFA's VND Web site. "By modifying the quarantine area in Southern California, we are building upon an ongoing effort to eradicate virulent Newcastle disease," said Dr. Jones. "The primary way that VND spreads is by people moving sick birds. Extending the prohibition of bird movement across a larger area is the next logical step in being able to stop the spread of the virus and to eradicate the disease." The 2002-03 END outbreak, originally confirmed in backyard poultry in Southern California, spread to commercial poultry operations in California and backyard poultry in Arizona, Nevada and Texas. The Governor of California declared a State of Emergency, the Secretary of the United States Department of Agriculture (USDA) declared an Extraordinary Emergency, and local emergencies were declared in San Diego, Riverside, Los Angeles, and San Bernardino Counties. A USDA and the California Department of Food and Agriculture (CDFA) Task Force was formed that involved over 7,000 individuals rotating in and out over the course of the outbreak. Trade restrictions resulting from the disease had negative impacts on California and U.S. poultry and egg producers. The outbreak, from discovery to eradication, lasted eleven months. The outbreak response led to the depopulation of 3.16 million birds at a cost of $161 million. Outbreaks of END severely affect the poultry industry. In 1971, a major outbreak occurred in commercial poultry flocks in Southern California. In all, 1,341 infected flocks were identified and almost 12 million birds were destroyed. The eradication program cost taxpayers $56 million, severely disrupted the operations of many producers and increased the prices of poultry and poultry products to consumers.